To prepare this delicious breakfast recipe, first destem and de-seed the green capsicum. Also, deseed the tomato and peel the onion. Now, finely chop the onion, green onion, capsicum, green chilli, and tomato. Keep the chopped vegetables aside. Put a frying pan on medium flame and heat oil in it. Once the oil is hot, add the chopped tomato, spring onion, capsicum, green chillies, and red onion in it. Stir fry all these vegetables till they are cooked. It will take around 2 minutes. Once done, remove the pan from flame. After that, break the eggs in a large bowl and beat them well. Put a non-stick pan over medium flame and brush it with some oil. Pour some of the beaten eggs in the pan and swirl it around. Let the eggs cook. Once they are half-cooked, add some part of the stir-fried vegetables on the top and flip it over or fold it in half. Let the eggs cook till they begin to set. After that, use a spatula to scramble the eggs in large curds and let them cook till they are light-brown in colour. 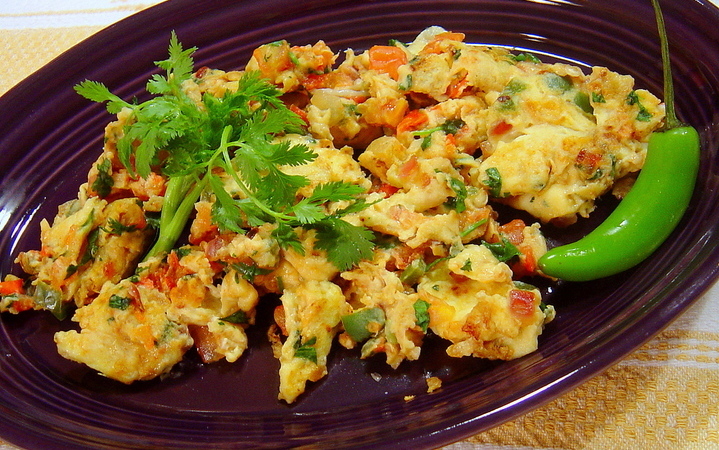 Once the Mexican scrambled eggs are ready, transfer them to serving plates, garnish with a herb of your choice, and serve them immediately.